DAR ES SALAAM, Dec 11 2013 (IPS) - Some say it’s the journey, not the destination that matters. Hop aboard the Tanzania-Zambia Railway Authority (TAZARA) line at Tanzania’s Dar es Salaam port and begin the 1,860-kilometre journey to Kapiri Mposhi, a small town in Zambia’s Central Province, and you may find yourself pondering this adage. For a large number of passengers using what is known as the “Freedom” or “Great Uhuru Railway”, it is about getting from point A to point B safely. The railway line is a necessity today, given that some roads in southeastern Tanzania are poor, impassable or nonexistent. “Try and travel on those buses … You’ll pray you arrive,” Lawrence Pangani, a pension scheme manager who is listening to music on his portable stereo, tells IPS. Pangani, along with a number of Zambian and Congolese businessmen, are travelling in TAZARA’s first class cabin as the train crosses the Rift Valley. He is making his way from Tanzania’s capital, Dar es Salaam, where he was working, to his home in Kabwe, which lies west of Zambia’s capital Lusaka. The railway was built in the 1970s with an interest-free loan of about 412 million dollars from China. At the time, it was the largest single foreign-aid project undertaken by the Asian country. TAZARA was handed over to Tanzania and Zambia in 1976. It became a significant alternative transport system for Zambia, a copper-rich but landlocked southern African state which, at the time, was sanctioned by still-colonised neighbouring regimes for supporting the liberation struggle of many of those countries. But in recent times TAZARA has veered off track. Just over five years ago the railway was said to be “on the brink of collapse” after accumulating debts of up to 45 million dollars. In 2011 China, described by TAZARA spokesman Conrad Simuchile as the railway’s “surrogate mother”, signed a protocol with the Zambian and Tanzanian governments, writing off roughly 50 percent of their debts. Simuchile tells IPS that most of the support for TAZARA, in the form of equipment and expertise, has come from China. He stresses that there are no conditions attached to the assistance. But even with this help, the railway is still struggling. In September it was reported that revenue had averaged 1.53 million dollars per month against an estimated average expenditure of over 2.5 million dollars. A two-week strike, which began in August over the unpaid wages of 1,067 workers, cost TAZARA 1.4 million dollars and inconvenienced 46,000 passengers. The company desperately needs recapitalisation, says Simuchile. “We are doing so badly right now. But this is not a write-off. This company, TAZARA, is not a perpetual loss-making company [as some places have dismissed it],” he says from his office at the railway’s Dar es Salaam headquarters. He says government ministers have recently given the company leeway to look for smart partnerships with the private sector without necessarily affecting the shareholding structure. Simuchile is optimistic the line will be extended to Lusaka in the next two years. Nelson Nyangu, director of transport in Zambia’s ministry of transport, works, supply and communication, says TAZARA is a “lifeline” for Zambia and its operations must be “immediately revitalised”. “At present the authority is experiencing serious operational and management challenges that have resulted in the company operating below break-even point,” he tells IPS. TAZARA’s hauling capacity has gone down from a peak of over one million mega tonnes per year to less than 500,000, Nyangu says. However, there are still about 900,000 passengers who use the railway annually. Today, farmer Emmanuel* is transporting his rice to sell at the local market in Makambako, a town in Tanzania’s southern highlands. A super-seater ticket cost him about nine dollars, compared to a bus ticket that costs nearly 25 dollars and involves three changes. TAZARA runs two passenger services a week. The one that departs Zambia on Tuesdays is called the “Mukuba Express”, mukuba meaning “copper” in the country’s Bemba language. The Friday service from Tanzania is called “Kilimanjaro”. Today’s Kilimanjaro service left Dar es Salaam nearly 10 hours late and is failing to make up time. “I was supposed to pass through this place at night. Now it’s daytime, meaning my schedule has been delayed,” says Emmanuel, speaking in Swahili through an interpreter. Simuchile admits there are “breakdowns on a weekly basis”. “The things you experience on TAZARA are the real life experiences Africans have on a daily basis. The hiccups you face are part of the reality,” he says. “So the important thing is to get on TAZARA with an open mind.” And an open schedule. But for some foreign passengers who are travelling on a train in Africa for the first time, these “hiccups” may be what is most exciting about the trip. 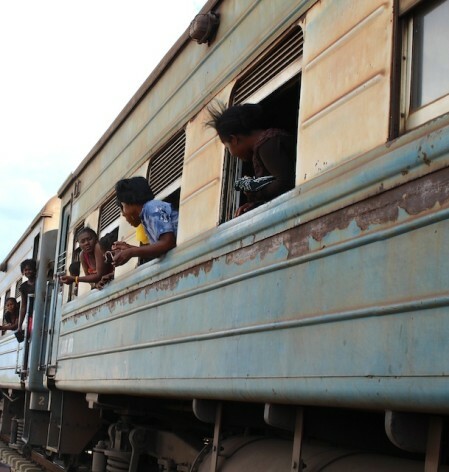 Sara Strandstoft, her partner Jacob Anderson, and their two boys travelling on TAZARA. After three days on board, the Danish family still does not know when they will reach their final destination of Kasama, in Zambia’s Northern Province. “We took our watches off, time goes as it goes,” Strandstoft tells IPS, laughing.